Kit Rae Ellexdrow War Spear With Art Print | BUDK.com - Knives & Swords At The Lowest Prices! One of my favorite kinds of weapons are pole-arms. This site sadly doesn't have many but when I saw this I just had to get it. Much like the picture it is indeed beautiful. However there is a reason why I am not giving this a 5 star. Pros: The staff part is made out of steel which makes it more stronger than the wood pole-arms you normally see. It is hollow which makes it more lighter. I like the straps they put on it which gives you grip. Because of the way it was design, it looks battle ready. Cons: Not sharp whatsoever and will be extremely hard to sharpen it (Unless you use a grinder but I don't like uses those). Even if it was design to look battle ready, it isn't battle ready (don't use it to cut boxes or stab things, might not hold up very long). I notice that there is the steel ring at the very bottom of the last blade that isn't fully touching the steel pole. Also not sure how much tang there is but it isn't full and not sure if it is the dreaded rat tang. This is for people that want something cool in there room but cannot be used and if so then at your own risk. First time I have bought from this site. I am a little nervous when I buy from a new site. So I choose this spear as my first purchase. I was so happy. This could have not been any better. Poster was beautiful. the box was a little beat up which I was fine with cause the spear was fine. Will be buying more. 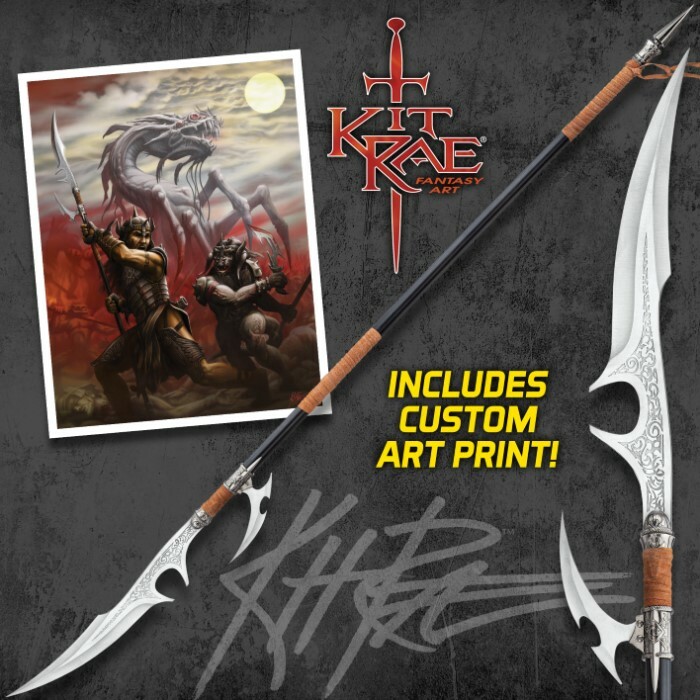 The Kit Rae Ellexdrow War Spear is Bad A** what else can I say? For less than $100 I have my favorite fantasy related weapon by far. I can't wait to buy more Kit Rae products! My first Kit Rae piece, and I am overjoyed with the Ellexdrow spear. Once again Budk and United Cutlery has produce an excellent product. I was looking for something different, I collect the Lord Of The Rings swords, and I am glad to to have purchased the Ellexdrow. It showed up quick and on time as expected with True Swords shipping, the spear itself was in decent quality. It has stains on the blade and the shaft that were quite difficult to remove and the nicks in the blades that are noticeable from about 10 feet away. Overall it is a nice spear just disappointing I expected better quality from the company from the things I had heard about them. Also the certificate of authenticity and poster were folded upon arrival making them hard to hang next to the spear and making them look a bit trashy. just got this today, i was not disappointed at all. i love this spear. Very nice spear! For almost $100.00 I was a little worried it would be not up to par. It's well made and solid! It's not sharpened but the tips are razor edged. This is very nice and worth the bucks! Impressive! I have a couple of other Kit Rae designs but this still exceeded my expectations: Beautuful, outstanding materials and craftsmanship. Love the look and feel of this piece, and I imagine it would be formidable in combat! As usual, trueswords price, service and fast shipping make ordering a pleasure! Incredible piece of artwork! 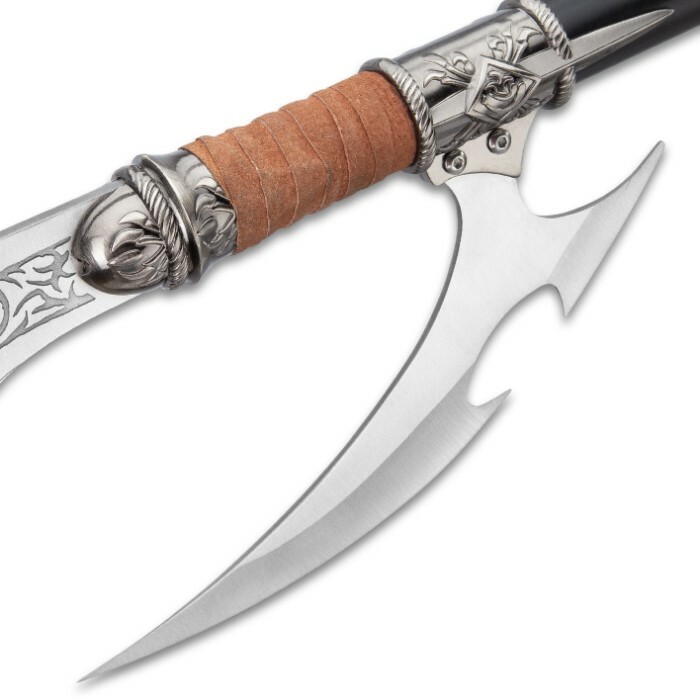 It's a great addition to any martial weapons collection and as always Trueswords' service is second to none!